As they processed onto the Glasgow Royal Concert Hall stage back in January 2000, String Sisters gave not the slightest impression of being terrified. Here was a sextet of the international folk and traditional music scene’s top fiddle players slow marching to April’s Child, a tune brought to the group by Annbjorg Lien, the Norwegian representative in a Shetland, Irish, American, Canadian, Scandinavian troupe. Their sound was richly harmonic, stately and measured, although the two days preceding this debut were, recalls Shetlander Catriona Macdonald, frenetic. Macdonald had conceived the idea – there was word at the time that it had come to her in the bath – of gathering top women fiddle players into an ensemble that would celebrate all of their traditions. She took this to the then director of Celtic Connections, Colin Hynd, who immediately got behind it. Hynd it was who did all the contacting and negotiating, a laborious task in these pre-email days, and when he put it together, as Macdonald says, he didn’t hide it away in some corner of the Celtic Connections programme. Macdonald’s intention wasn’t to form a band that, eighteen years on, is still together and looking at exploring new territories. As someone who had been in the line-up of another supposed one-off fiddle celebration, pan-Highlands and Islands supergroup Blazin’ Fiddles, she might have known that String Sisters would develop a life of its own. “The original idea came to me after I’d been touring a lot with the accordion player Iain Lowthian in Ireland, the US and the UK during the 1990s,” says Macdonald, who these days is Senior Lecturer and Degree Programme Director in Folk and Traditional Music at the University of Newcastle as well as being a gigging musician. In Colin Hynd she found a festival director who was only too willing to make it happen and rebook the band the following year, leading to its continuation. The comment that tickles Macdonald most when people see the cover of Between Wind and Water, the String Sisters’ recently released second album (their individual schedules have meant that the group hasn’t been prolific) is, “But there’s men in it!” This is down each of the fiddlers bringing an accompanist to the first concert. In Macdonald’s case she brought her regular rhythm section, pianist David Milligan, bassist Conrad Molleson and drummer James Mackintosh who became the nucleus of the String Misters, a backing band that would come also to feature Norwegian guitarist Tore Bruvoll. From the start the combination of six fiddle players each lending their own styles, accents and bowing techniques to the ensemble gave String Sisters a richness of sound that might even have surprised Macdonald. 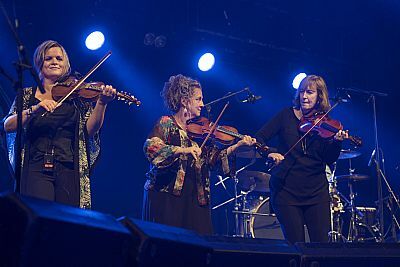 As well as their instrumental capabilities, Mairead Ni Mhaonaigh and Emma Hardelin, who replaced original member Natalie MacMaster, from Cape Breton, when she had to step down due to work commitments, bring very distinctive voices to the group. On the new album Ni Mhaonaigh sings Wind and Rain, an American version of the Scottish ballad The Twa Sisters, and Hardelin draws on the Swedish song tradition with the strikingly dramatic tale of unrequited love and betrayal, Det Bor I Mina Tankar. After eighteen years, with only a few adjustments in personnel, String Sisters has become a family unit. Some of the musicians have become mothers (and fathers) during the time they’ve been working together and for Macdonald the sense of having a friendship group to call on has become increasingly reassuring and important. “Having five other women who havealready gone through or are going through what you’re going through is brilliant,” she says.